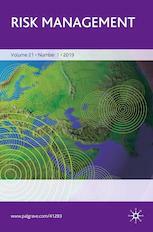 This journal focuses on research related to risk in the financial sphere, but is also interested in research tackling other types of risks at the corporate, institutional, and/or regulatory level that are perceived to be important and interconnected (for example, various operational risks). Risk Management builds bridges between the academic study of risk and the day to day application of risk management principles in a variety of real-world settings. Among the finance topics covered in the journal are financial risk management including dynamic forecasting of financial distress; exchange rate exposure and financial crises; risk quantification in turmoil markets; and financial stress testing. The journal publishes research relevant to banks and insurance companies, asset management companies, and non-financial corporations. Risk Management serves an audience of practitioners, regulators, academics and others who are interested in quantitative perspectives on contemporary issues, and practices in the field, as well as both theoretical and practical advances.